*163 samples to choose from! Our most popular woven wood series that offers a WIDE array of decorative trim choices, edge trim borders and more! Woven wood blinds are frequently called bamboo shades because they are often made of bamboo. However, woven woods are also made from wood and rattan and can incorporate jute, grass and reeds in their weave creating lovely patterns. 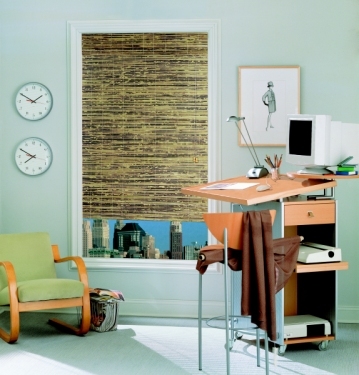 Woven wood blinds add so much casual, natural beauty to your room, you�ll forget how well they insulate the room. Our Island Treasures collection (from Prestige) and has over 70 different patterns in five price groups.